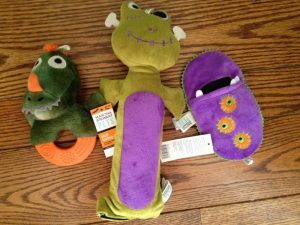 Thank you to PetSmart for sponsoring this post on Halloween Costumes and Toys for your pets. My daughter is the only one who has her costume picked out so far. You can find the review of the tween Halloween costume here. My boys will come up with something at the last minute I am sure. While visiting PetSmart I noticed their Halloween Pet accessories are out in full force. In Fact they were on sale the day I went. This year PetSmart has teamed up with the brands you love like Martha Stewart, Disney Sesame Street and more, so you can find the perfect costume to match your pet’s personality this holiday! Whether you are a Nemo fan, an Elmo lover or up for a glowing good time, we’re sure that you can find a costume that you and your pet love! Ironically I chose the black cat, since Chloe does not get along with our “black Cat” I thought it would be pretty funny. Unfortunately I chose the costume without measuring Chloe and figured at 75 lbs she was an XL. I think Martha Stewart spends to much time with NYC dogs. Chloe did not even come close to fititng in this hoodie costume. I borrowed her buddy from across the street, he is about 40 lbs. Still too small. As my neighbor said, Chloe needs to shop in the PLUS SIZE section. Unfortunately these are not costumes for your larger dog. You will have to just use a head piece or maybe a T-shirt style. The Halloween Costume hoodies are adorable but not for this size dog. There are plenty of adorable Martha Stewart Halloween Pet Toys. Here are a few of the selection Chloe will be devouring for Halloween. She always adores the water bottle toys. Be sure your pets’ costumes ready October 19 –PetSmart is hosting in-store events where pet parents across the nation are invited to join in on some costume fun. What Halloween Costume will you be dressing your pet in this year? One lucky winner from Close to Home will win a Halloween Costume and Toy for your pet from PetSmart. Just be sure and measure your dog before choosing. When our young adult daughter and her little yorkie (our granddoggy) Buxton stayed with us a little while, we had fun celebrating Halloween with them one year and I don’t remember what he was dressed as, but we did dress him in a cute costume from the store and he loves kids so the little trick or treaters were tickled to have him greet them at the door in his costume as we handed out little debbies to them that year. : ) Our daughter and Buxton have their own place now and I don’t know if he being dressed up this year or not. Another cute thing is he actually likes wearing clothes or costumes! If we held up an outfit for him, he’d come RUNNING to us right away and then he’d lift one front paw as if to try to help us put his leg in the sleeve, haha sooo cute. I would love the Cookie Monster costume since Sissy is such a “cookie monster”. I would love to dress up my pups for Halloween! I really want to dress one of my shelties up in a cow costume! Thanks for the review and giveaway. Eeyore Costume Pls! Thanks you for the chance! I love dressing up my doggies for Halloween. I have eight dogs, three of which are rescues. I don’t dress all of them up but I always dress up a couple of them and take them through the neighborhood in their costumes. We have done cow, pumpkin, devil, dinosaur, ghost, and several others. If I won I’d pick a costume for my oldest girl. She’s the one who enjoys it the most. I would pick eyeore for her and I’d probably end up buying tigger for one of my boys to match her. I also reall like the Martha Stewart dragon costumes. There are lots of cute ones this year and I’d love to win a costume for my fur baby. They would enjoy a toy to share to. Thanks for the chance to win! I like the Mini Mouse or princess costumes for my Sookie, but it’s difficult to decide! We would pick the following costumes: Batgirl for Bella, the Alligator for Kronos, and the Devil costume for Terra. All the costumes are super cute! Hard to pick… I’ve been at Petsmart a lot recently for training classes and have seen a lot of very cute costumes. I’m leaning toward either Tigger and Eyeore (since they’d match my dog’s personalities) or the martha stewart monsters line is very cute! 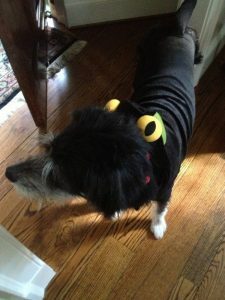 It would be great to win a Halloween Costume and Toy for my pet from PetSmart. and let you know which costume i would pick. I would pick The Grreat Choice PetHalloween Jester Costume for my cat. I’d pick the Sesame Street® PetHalloween™ Ernie Costume . Cowboy costume for my doggie! I’d pick the cat pirate hat!